LLacuna 39 is a cohousing project for 27 family units including common areas in the neighbourhood of Poble Nou in Barcelona. In order to finance this project our cohousing co-op has issued 1600 co-op securities worth € 500 each, totalling € 800000. The idea is to finance 40% of the purchase of a privately owned plot of land in the Poble Nou quarter of Barcelona destined for social housing. 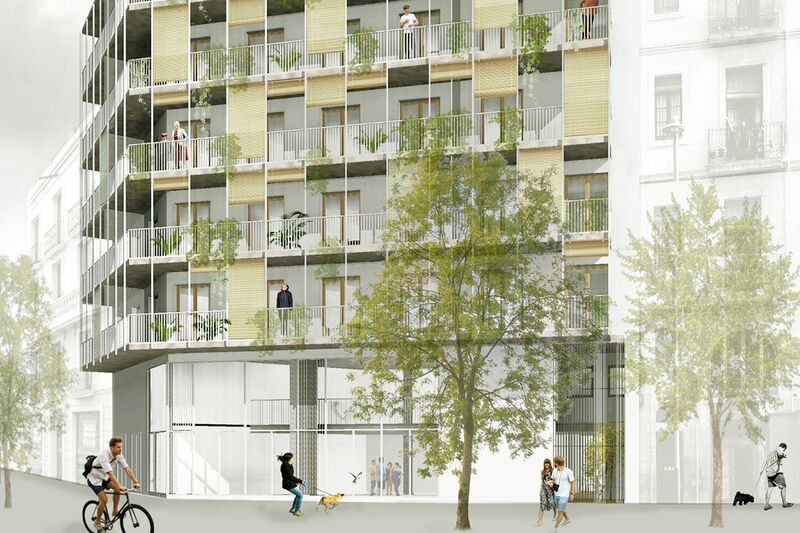 The remaining 60% will be paid for by the future tenants.In order to finance this project our cohousing co-op has issued 1600 co-op securities worth € 500 each, totalling € 800000. The idea is to finance 40% of the purchase of a privately owned plot of land in the Poble Nou quarter of Barcelona destined for social housing. The remaining 60% will be paid for by the future tenants. This project will enable these 27 family units to have access to decent and collaborative housing. Co-op securities or participative securities are an opportunity to participate financially in collective housing by investing in our projects. Besides contributing to a good cause your investment yields up to 5% annually. How many securities are for sale? 1,600 co-op securities, worth € 500 each, totalling € 800,000 have been issued. How many securities can I buy? You can buy as many securities as you like until they have been sold out. What time span are we talking about? You can invest in these fixed deposits ranging from 1 to 3 years. At expiry, deposits can be renewed. You can buy securities from September 16 to November 30. 1 year fixed deposit = 3% p.a. 2 year fixed deposit = 4% p.a. 3 year fixed deposit = 5% p.a. Llacuna 39 is a cohousing project for 27 family units including common areas in the neighbourhood of Poble Nou in Barcelona, namely 39 Llacuna Street. It is a unique communal social housing project because everyone can participate in its development from beginning to end. The implication in the entire process contributes to the feeling of community and enables its members to take collective action. Whereas the acquisition of our homes is usually limited to an individual economic interchange, cooperative housing not only permits easier access to homes but also much better conditions. CoHousing Barcelona enables people to stay in their neighbourhoods in spite of souring real estate prices and to get involved in their surrounding community. We provide a community oriented space of interchange housed in a building that has been designed taking advantage of the latest innovations in sustainability, energy efficiency and healthy housing. Property tenure and ownership in housing co-ops can have many legal forms, spanning form Right-to-Use to Exclusive Ownership. Integrated or mixed formulas are also possible. We at coHousing Barcelona have designed a mixed formula of tenure where each co-op member of a given project is the exclusive owner of his or her home. The common areas, however, are owned by the co-op which is also in charge of maintenance of the building. Our legal basis is Spanish Cooperative Law which is the framework for our activities and the regulations passed by our coop. They include an agreement amongst co-op members to sell their homes exclusively to other co-op members who are on the co-op waiting list. This way we put a stop to real estate speculation. Homeowners who decide to leave the cohousing community are entitled to recover their investment in full. Come to our events and workshops or drop us a line at: info@llacuna39.cat. Tell your family and friends about Llacuna39. Share our web and follow us on FB. If you wish to support this or any of our other projects write to us at info@llacuna39.cat. You can download the design and layout of Llacuna39 by clicking here.